Offering you a complete choice of products which include pipe elbow, alloy steel 45 degree elbow and super duplex elbow. 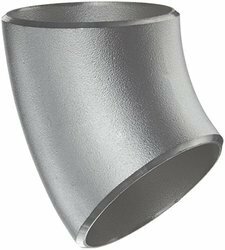 We have established ourselves as a prominent stockist and exporter of Pipe Elbows and Pipe Elbow Fittings. All our products are sourced from trustworthy vendors of the market, who make use of carbon steel, alloy steel, stainless steel and high-grade metal in the manufacturing process. The elbow offered by us are widely used for connecting two pipes or tubes, allowing a change of direction. Customers can avail short and long radius elbows from us. Moreover, the offered products are widely appreciated in the market for their features like resistance against corrosion & abrasion, seamless finishing and dimensional stability. ASTM A 815 UNS NO S 31803, S 32205, S 32760, S 32750. Thread Size 1/2" to 20"
Material A234 Wp11, WP22, WP 91 etc. Available Grades A234 Wp11, WP22, WP 91 etc. 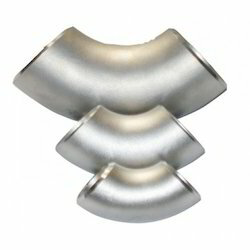 We have established ourselves as a prominent manufacturer and exporter of Pipe Elbows and Pipe Elbow Fittings. The elbow offered by us are widely used for connecting two pipes or tubes, allowing a change of direction. Customers can avail short and long radius elbows from us. Moreover, the offered products are widely appreciated in the market for their features like resistance against corrosion & abrasion, seamless finishing and dimensional stability. 45 Deg Elbow, 90 Deg Elbow, 180 Deg Elbow, Short Radius, Long Radius, Any required deg.